Claude Monet, Grainstack series painting W1280, 1890-91. WikiArt. Discovery of what appears to be Monet’s signature on a painting which he could have made should be good news for the Serlachius Museum in Finland, if for no one else. 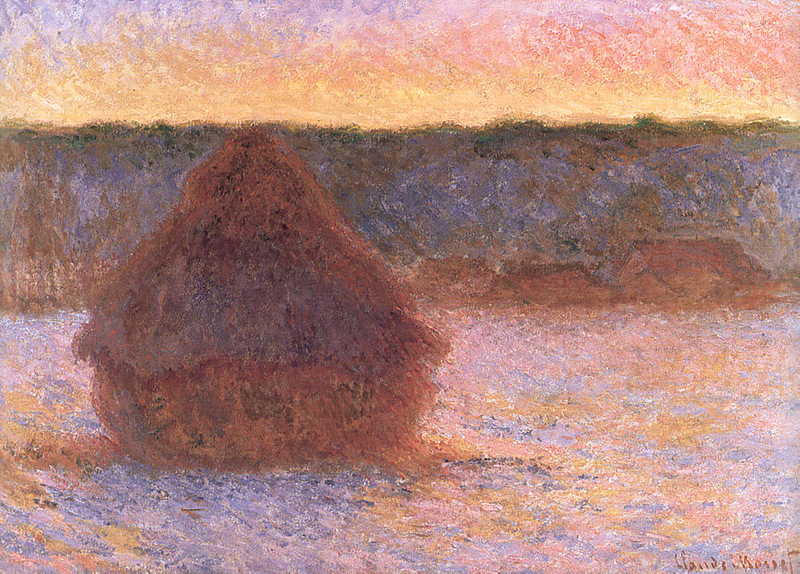 However for me it deepens the mystery surrounding Monet’s celebrated Grainstack series of 1890-91. The story of Monet’s Grainstacks is told from fact, rather than the myth that so often surrounds him, in Daniel Wildenstein’s four-volume catalogue raisoné (Taschen and the Wildenstein Institute, 1996). The narrative is in volume 1, pp 274-279, and the individual paintings are illustrated and detailed in volume 2 from p 482 onwards. The French word in each of their titles is “meules”, which here means a stack of cut cereal with the grain still attached, a grainstack rather than haystack (which contains hay, the threshed cereal). In the late eighteenth century in northern France, it was standard practice to cut cereal crops when they were ready at the end of the summer, then to stack the intact stalks and heads until an itinerant threshing machine visited the area, and the grain could be separated from the hay. Claude Monet first painted a series of canvases depicting grainstacks at Giverny – literally outside his back yard – in 1889, and by any account the Serlachius work is not one of that series. In the early autumn of 1890, Monet started a fresh series consisting of two grainstacks, now accorded Wildenstein numbers of W1266 to W1279. During that winter, the farmer was able to start threshing, and one of the grainstacks was consumed. Apparently Monet paid the farmer to retain the single remaining grainstack so that he could continue the series, following which he painted W1280 to W1290, which each show the single grainstack. After various delays during which Monet apparently made further adjustments to the paintings in the series, 15 of them were shown at an exhibition at the Durand-Ruel Gallery, 11 Rue le Peletier, which opened on 4 May 1891. 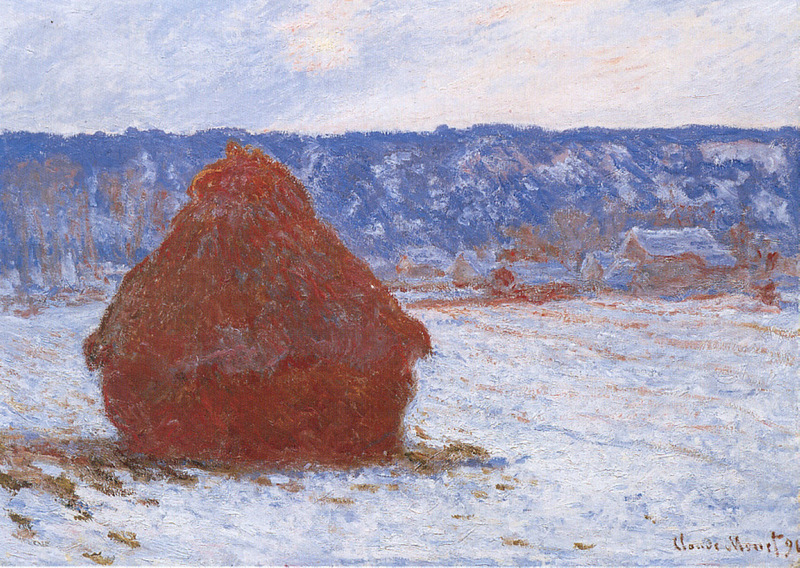 They all sold, for sums of up to 1,000 francs, and provided Monet with an excellent return for the winter’s work. The remaining 10 paintings in the series were sold to Durand-Ruel and other dealers by the end of 1891, and all have now been dispersed into art galleries and private collections around the world. Wikipedia’s article on the series here gives further details. However the last time that most of the works in this series were shown together was in May 1891. The following year Monet started his still more famous series of Rouen Cathedral, completed in 1894. 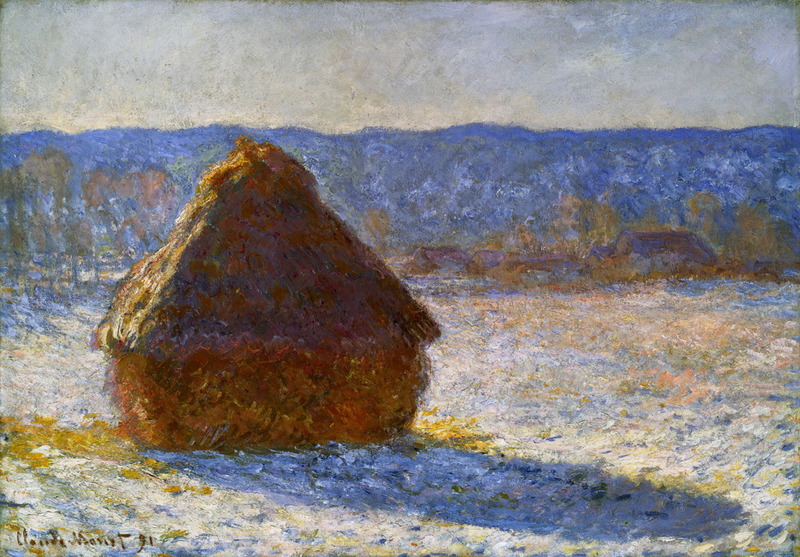 The myth about the Grainstacks is that they depict transient effects of season, weather, and light, as they were painted plein air over the course of the winter. Looking at all 25, I have long had my doubts, and suspected that Monet spent a lot of the time prior to their exhibition making further changes to them, which could not therefore have been en plein air nor even faithful accounts of each motif at the time. Finding a signature on a painting which appears genuine does not of course prove the authenticity of the work. Even in 1891 a Grainstacks painting by Monet was worth a tidy sum, and in today’s market would probably fetch tens of millions of pounds/dollars/euros. There have therefore been high incentives to others to create an extra member of the series, ever since their first appearance in 1891. Although I am unable to reproduce an image of the painting in question, you can see it here, here, and here, accompanied by fairly accurate but uncritical reports of the work undertaken at the University of Jyväskylä’s RECENART Research Centre for Art to examine the painting. In case you think that this is an amazing new technique, it is infrared imaging similar to that used for many years by other centres of this type. Although XRF spectroscopy was also used, it provides compositional information on pigments used rather than reveals the signature. Careful study of this painting raises many questions, if it is to be accepted as being authentic and a member of Monet’s 1890-91 Grainstacks series. Look carefully at the hills in the background, which are shown as being low, sloping down further to the right, and without any sign of a ‘notch’ in the skyline. The farmhouse and other buildings are high, with three trees in a distinctive pattern to their left. On each side of the single grainstack there is a pile of residual material, as if from a removed grainstack. The sunlight falls from the front left of the painting, and the shadows are relatively short, although the supposed title places the time of day in the evening. Compare this with accepted members of the series such as W1280 to W1282, which are from a very similar angle. The skyline of the hills in the background is higher, and quite level. The farmhouse, buildings and trees in the middle distance are quite different in form. Claude Monet, Grainstack series painting W1281, 1890-91. WikiArt. No other painting in the series of 25 shows any remnants of cut grain to the sides of a single remaining grainstack. Furthermore, whilst they each depict the single stack during winter, the Serlachius painting shows clearly that it was painted in late spring, or possibly the autumn of 1890, when the trees and shrubs of the hedgerows were still in full leaf. Claude Monet, Grainstack series painting W1282, 1890-91. WikiArt. If Monet really did paint this 26th member of the Grainstacks series, then it appears to be a complete anachronism, and its passages are baffling. If you wish to see the painting for yourself, it is apparently going to be shown in an exhibition at Århus Kunstmuseum, Denmark, from 9 October 2015 to 10 January 2016, listed here. How appropriate that the title of that exhibition is Monet – Lost in Translation. Posted in General, Painting, Technology and tagged authenticity, grainstacks, infrared, Monet, series, Serlachius. Bookmark the permalink.